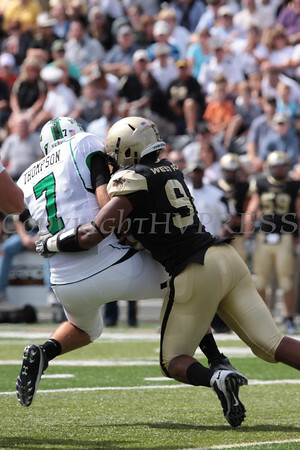 Army DE Jarrett Mackey (#94) sacks North Texas quarterback Derek Thompson (#7) for a loss of eight yeard during a second down and 10 during the first quarter of their game in Michie Stadium at the United States Military on Saturday, September 18, 2010. Army defeated North Texas 24-0. Hudson Valley Press/CHUCK STEWART, JR.